The French have a legendary sense of style that is synonymous with a joyous, sophisticated way of life, joie de vivre. Elegant and witty, French chic a clever mix of classic and contemporary sums up de Dampierre s design sensibility. Using Edith Wharton s The Decoration of Houses as a model, she provides advice on how to achieve this distinctive look. The fascinating French decorative history of such architectural elements as windows, fireplaces, and doors, along with basic design principles, is given to provide the origins of the essence of chic. Stunning photography of her home from the striking entrance hallway with its leopard-pattern carpeted staircase to the sensual master bedroom enlivened with charming toile wallpaper and the resplendent gardens dotted with topiaries captures the designer s personal invocations of the best of French chic and empowers the reader to duplicate the experience at home. French Chic is the perfect guide for creating vibrant living spaces with flair." .,. "de Dampierre provides a context of French decorative history...and architectural elements to provide a blueprint to obtain the "je ne sais quoi" of French chic." "~New York Living"
.,. "analyzes function and furnishings, leading readers through (de Dampierre's) house room by room with the help of lyrical photography..." ~"Veranda"
"Filled with photographs, the text is also interspersed with sidebars offering useful pointers on the "je ne sais quois "of French design, as well as a myriad of practical suggestions."
. 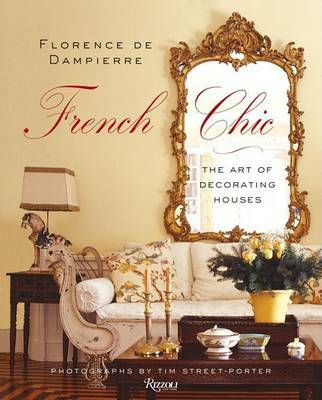 "..de Dampierre provides a context of French decorative history...and architectural elements to provide a blueprint to obtain the "je ne sais quoi" of French chic." " New York Living"
. "..analyzes function and furnishings, leading readers through (de Dampierre's) house room by room with the help of lyrical photography..." "Veranda"
"De Dampierre fills the book with historical references, anecdotes and modern style tips. This would make a great gift for someone with a sense of fun and love of French style." "IDFX Magazine"
"French Chic is more than just a decorating primer. Although it has some of the elements of Bunny Williams' very successful book, "An Affair with a House", the reader will emerge with a deeper understanding of the history of decoration and the rationale behind many ornamental elements taken for granted in today's houses." "The Home Observer"
..".de Dampierre provides a context of French decorative history...and architectural elements to provide a blueprint to obtain the "je ne sais quoi" of French chic." " New York Living"
..".analyzes function and furnishings, leading readers through (de Dampierre's) house room by room with the help of lyrical photography..." "Veranda"
De Dampierre fills the book with historical references, anecdotes and modern style tips. This would make a great gift for someone with a sense of fun and love of French style. "IDFX Magazine"
French Chic is more than just a decorating primer. Although it has some of the elements of Bunny Williams very successful book, "An Affair with a House," the reader will emerge with a deeper understanding of the history of decoration and the rationale behind many ornamental elements taken for granted in today s houses. "The Home Observer""